After around 18 hours of flying, I arrived in Taoyuan International Airport in Taipei on Sunday, August 26. Because of the lovely time zone difference, I left home on Friday, August 24, so it was a long trip! I met the other students on my CIEE program—there are 11 of us—at around 9 am, so we had the full day to get settled, learn a little about Taipei and National Chengchi University (NCCU), and try to beat the jetlag (this last one was rough). My two biggest impressions of Taipei from my first day here were of the food and the heat. 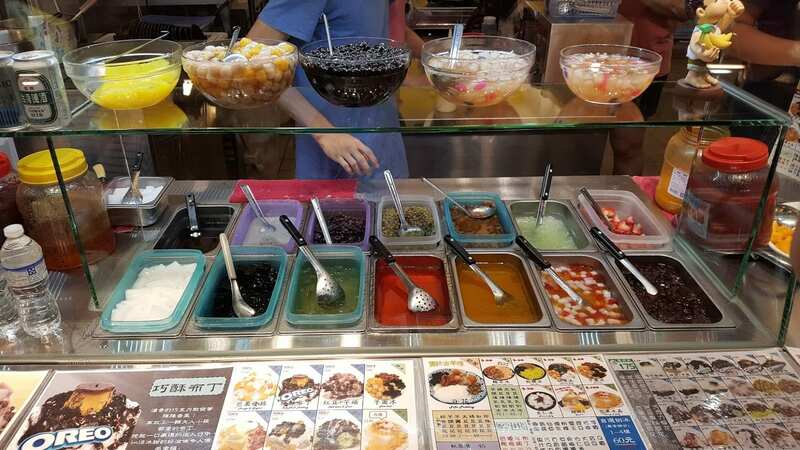 The food here is AMAZING—there are dumplings, bubble tea shops on every street, fresh fruit, shaved ice, bakeries, basically every delicious food you could ever imagine—and it’s all cheaper than it would be in the U.S. The weather is also amazing—amazingly hot and humid. But it’s a small price to pay to live in Taipei! Our first week consisted mostly of orientation activities to get us CIEE program students acclimated to life on the other side of the globe. Taipei is the capital of Taiwan, an island nation (officially the Republic of China) located in the Pacific Ocean near China. 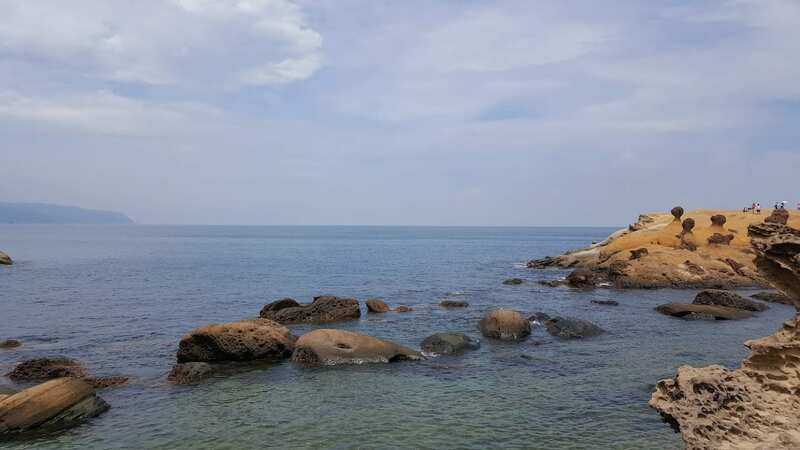 Whether Taiwan is a part of China or its own country depends on who you ask, and its old name is Formosa, meaning “beautiful” (for “beautiful island”)—which is exactly what it is! During orientation week in Taipei, we met our Cultural Ambassadors (NCCU students who can accompany us as we navigate Taipei and help us practice Chinese), learned about the good places to eat around campus, and how to take the public transportation. It was definitely overwhelming at first, going around the big city with everyone around us speaking Chinese and seeing all the signs in Chinese, but after a little more than a week and a half and a couple of forays into the city by myself and with friends, I’m starting to (hopefully) get the hang of it! 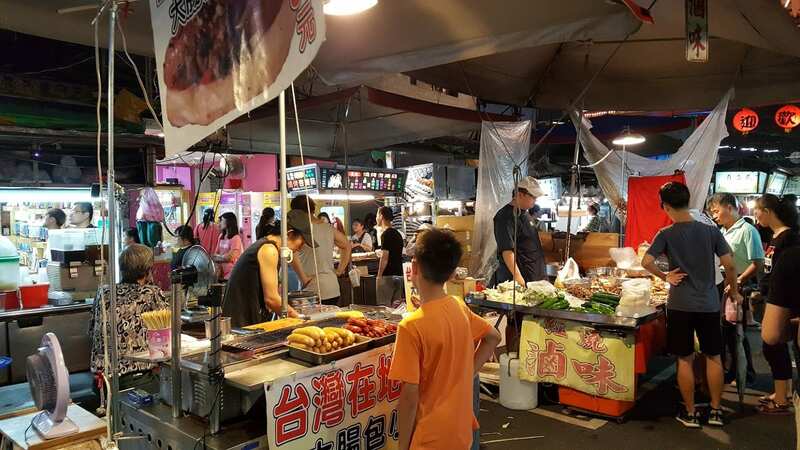 During orientation week, we went on a day trip and a walking tour of Taipei, among other fun orientation-y things, but my favorite was going to Raohe Night Market. Taiwan is pretty well-known for its bustling and lively night markets, which are walking streets lined with shops and stands with everything you can think of: food, of course, and clothes, stuffed animals, little trinkets, freshly-made juice—it’s pretty incredible. We went on a Saturday night, so the market was packed with people. Normally I avoid crowded places, but there was something about moving along in the slow stream of people, taking in all the smells and lights and sounds of people talking that was exciting. Already, then, the night market experience has taught me that stepping out of my comfort zone has its rewards—who knew I’d love walking around such a crowded and hot area? Now, I definitely want to go back, and to also explore the other night markets around Taipei. 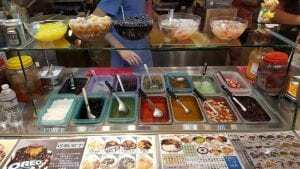 These are toppings you can put onto shaved ice, one of my favorite things to eat here! This week we started classes. NCCU is a big university with 16,247 students—a LOT different from Whitman. It’s separated into an upper and lower campus, with upper campus (where I take my language class and where my dorm is) on a mountain, and lower campus at the bottom of the mountain. There’s a bus you can take up and down the mountain, but I’ve also gotten used to walking. Plus, when you see sixty-year-old women walking up the mountain in long sleeves and long pants (I am in awe at Taiwanese people’s tolerance for the heat), you feel kind of silly for waiting for the bus unless you’re going somewhere in a hurry. Anyway, class so far has been challenging, but I expect I’m going to learn a lot of Chinese while I’m here! I take three hours of Chinese language class five days a week, and starting next week I’ll be adding another class, “Understanding and Misunderstanding the Art of China,” to my schedule every Friday for three hours. The language class is with other international students–in my class there are German, French, Thai, Indonesian, Swedish, and Czech students! Even though I’ll need to spend time studying for class, I also know a lot of the language learning comes from going around Taipei and talking to store/restaurant employees, asking questions, and observing the signs, so I’m going to try to balance studying with exploring the city! The biggest challenge so far, though, is getting around places with the language barrier, which makes settling into this new culture a little harder. For example, it’s difficult for me to read a lot of the restaurant signs on the streets, and when I do go into a restaurant, it can be hard to know what to do—do I seat myself? Do I pick up my own menu? Do I pay first or later? I don’t want to look like an ignorant foreigner, but I kind of am an ignorant foreigner! 🙂 Small things like this mark small cultural differences, and my not being able to read the signs or instructions in the restaurants—not to mention the menus—makes it more daunting. But I know that as time goes by, as I do things more and more, I’ll grow more comfortable with it and start to learn the little secrets to living in Taiwan. I’ll end this first blog post (before it gets too long) (it’s probably already too long) with a comparison, which I’m hoping will make this post more meaningful and artistic (unlikely). There are a lot of stray dogs living on campus and throughout the city. People will feed them and they find shelter under awnings when it rains, and, strangely, they seem to enjoy lying down in the middle of streets that aren’t too busy. I think that at this point, only a week and a half into my Taiwan adventure, I feel a little like a stray dog—I live in Taipei now, but I’m not always sure where to go or what I’m doing. But these dogs always look comfortable and seem to be at home wherever they are, whether they’re lying down in the middle of a road or running around with their friends. That’s kind of how I want to feel as the weeks go by. I know I’ll always look like a foreigner and people will be able to tell—and there’s nothing wrong with that—but hopefully I’ll become comfortable enough here that I can feel at home. We went on a day trip to three places, including Yeliu, which is where this photo was taken! Lots of cool rock formations carved by the ocean. This entry was posted in Uncategorized on August 22, 2018 by Michelle Foster.